The installation piece that defines Bryan David Griffith’s practice is the first thing we see on entering the small gallery of his solo show “Rethinking Fire.” It is a breathtaking commentary on human interference with nature titled “Broken Equilibrium” (2015). Two delicately arranged arcs of wood anthropomorphically guard a large, upright circle cut from a log. One of the arcs uses charred remnants of logs, reduced to organic oblong shapes in black; the other is a semicircle of thin logs compressed together and cascading upward, like new forest growth. The installation is a means of questioning why humanity disrupts the cycle of naturally occurring wildfires — an issue that the Flagstaff, Arizona, artist raises throughout the show. Griffith as alchemist is seen in several encaustic panels in which he literally captures smoke. 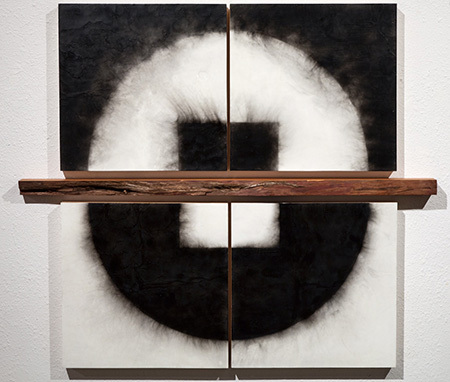 The black and white paintings are created using a process involving beeswax-coated panels and petroleum emissions. The crescents formed in the two-panel work “Wax & Wane” (2016) allude to the moon. In other pieces, he transforms log cross-sections into geometric sculptures through cutting and burning. In the installation “The Impermanence of Forests” (2016), the artist hangs a partially burned photograph of a smoke-choked forest right above a precise, reverential line of cinders retrieved from a fire site. An underlying sociopolitical posture is abetted by wall texts that quote fire scientists and land management experts who alert us: homes built too close to forests, prescribed burns, climate change. Griffith parlays such topics into visually stunning, thought-provoking works that owe their beauty to fire.